Video from Aug 29, 2018! Video from Sept 30, 2016! This video shows the quick progress our little Ashton has shown us in the game of Fetch-It/Air Retrieve). Within 4 months, he has learned the game, and then reaching distances that far exceeded our expectations. In addition, he is only 11 months old. Videos from Sept 5-6, 2015! Videos from Aug 23, 2015! June 6, 2015 – Lindy Lou Jumping Big Today! Lindy Lou never jumped this big before! Maybe giving her a few weeks rest did her good! June 6, 2015 – Lola getting in the pool by herself! Gunner hitting 7′ on May 17, 2015! Have you ever wondered what the Air Retrieve discipline is all about when it comes to our NADD events? This video should help answer some questions. Have you ever wondered what the Vertical discipline is all about when it comes to our NADD events? This video should help answer some questions. Some random clips of the diving dog sport! 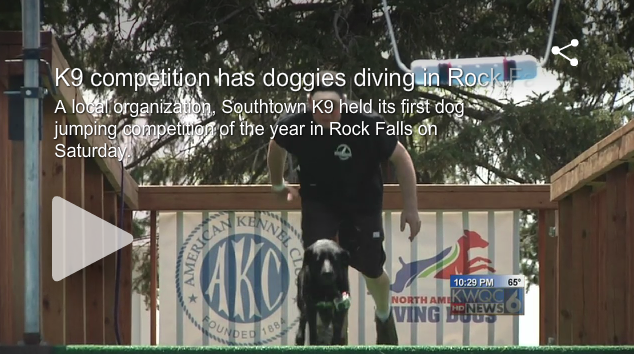 Clips include Southtown K9, NADD (North America Diving Dogs), UAD (Ultimate Air Dogs), and Dock Dogs. Weather held up nicely. Saturday was a little cloudy but temps were great with no wind. Sunday was sunny and warm! Everyone had a wonderful time competing! Thank you Tyler for putting together this video! Thank you for the video Tyler! July 7, 2014 – Lindy Lou getting some dock diving practice in. July 7, 2014 – Jackson getting some dock diving practice in. June 17, 2014 – Fun Jump on a Tuesday! Dutches got in the pool for the first time! June 15, 2014 – Lindy Lou’s first leap (well, this was probably her 5th or so today)! June 15, 2014 – Jackson catching some air!